(18/P003) TRENTON – The Hackettstown State Fish Hatchery in Warren County stocked a record five million cold, cool, and warm water fish consisting of 15 species in 2017, Department of Environmental Protection Commissioner Bob Martin announced today. The fish, totaling 5,082,841 with a total weight of more than 26,000 pounds, were produced at the location and many were stocked in approximately 200 waters throughout the state from March through November. Those five million plus fish included cool water species such as Northern Pike, Walleye, and Muskellunge. Hackettstown stocked 308,808 Northern pike, 2.3 million walleye, and 343,311 muskellunge for New Jersey anglers. The season also included strong year classes of warm water species such as channel catfish – 598,174, largemouth bass – 110,445, and hybrid striped bass – 47,315. These three species are providing excellent, exciting recreation for anglers throughout the state. Not all the Hackettstown fish stocked are directly available to anglers, however. County mosquito commissions utilized 548,000 fathead minnows, and Gambusia (commonly called mosquitofish) to combat mosquito larvae in stagnant waters. Since 1991, the hatchery has reared more than 5.6 million fish to help combat mosquito borne diseases such as West Nile Virus, Eastern Equine Encephalitis and Chikungunya. In addition, 655,000 golden shiners were stocked in Round Valley Reservoir to help boost the forage base in one of New Jerseys best cold water fisheries. The hatchery has stocked more than 1.5 million shiners in Round Valley over the past five years. Some of the many factors that contributed to a great season included the successful collection of broodstock and their eggs, an excellent hatch and extensive on-site pond management. Modern fish diets and nutrition also played important roles, as well as ideal temperatures, sunlight and precipitation for adequate growth, proper health monitoring and avoiding the hazards of overcrowding. The Hackettstown State Fish Hatchery opened in 1912 and is predominantly a put, grow, and take fish culture operation. This simply means that most of the fish are stocked as sub-legal fry and fingerlings that will take a year or more growing in the wild to reach a catchable size. The fish-rearing operation requires a combination of intensive fish culturing both indoors in fiberglass tanks and outdoors in earthen ponds. 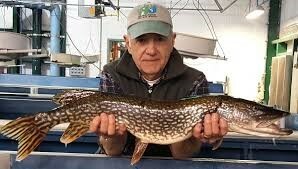 Funding for operations at the Hackettstown State Fish Hatchery is provided by anglers through fees derived from the purchase of fishing licenses and by the Federal Aid in Sportfish Restoration program. 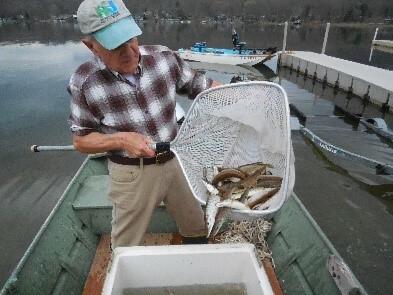 More information about the Hackettstown State Fish Hatchery, including its history, feature articles, species raised and stocking summaries can be found at http://www.state.nj.us/dep/fgw/hacktown.htm. Bottom: Fishery staff handling fingerlings at Hackettstown. Both photos courtesy of N.J. Division of Fish & Wildlife.